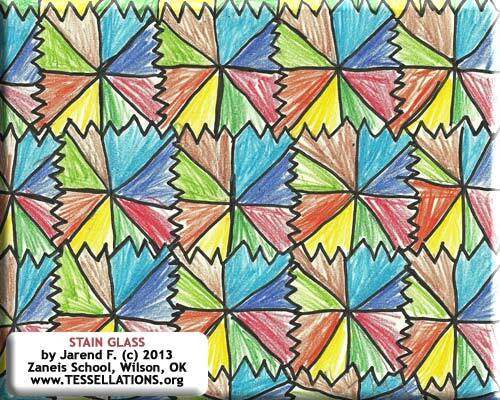 Unlike the other tessellations done by the Zaneis class of 2013, this one is abstract. The pattern is regular, but unlike M. C. Escher tessellations it uses a theme of arbitrary (but pleasing-to-the-eye) geometric shapes. It's an appreciation of the math and geometry that awes us in an abstract tessellation, not the clever resemblance to real-world objects, animals, or people. The Alhambra buildings in Spain contain hundreds of awe-inspiring abstract tessellations. M. C. Escher, the father of animal- and people-shaped tessellations, was inspired by the tessellations he saw in the Alhambra. Read more about Escher and the Alhambra by clicking here.